Last week I was at the Predictor-Lotto, soon to be Silence-Lotto, team training camp in Benicasim, Spain (near Valencia). Team members had medical and performance tests conducted as well as group training and lots of meetings. The above file is from Dominque Cornu and conducted on December 13. The ride was 4.5hrs and had a CP5 value of 413w, and a CP30 of 300w. Click here to view more details of the Dominique's file. By the way I suffered a ton each day on the training rides. I never took a pull and was happy to only have to hold onto the car on one climb. My maximum CP5 for the week was 445w and I'm sure I won't hit that mark again until about March or April in a race. If you are a cyclist be sure to ask for Jon. He is the resident tour guide and can help you rent a top of the line Ridley bike at a very good price. No need to travel with your bike to this hotel. Just rent a top of the line road or Ridley MTB and have fun. Snow and more snow! It has finally turned into winter in Boulder, the same day I fly to Spain for the Silence Lotto team training camp. Cadel Evans had an amazing 2007 season and won the overall ProTour Title. Of course Cadel also placed second in the Tour de France and 4th in the Vuelta! Great job Cadel and to all of the 2007 Predictor-Lotto team members. It was an honor for TrainingPeaks to be along for the ride and help the team manage their training and race data. The team's name is changing to Silence Lotto for 2008. Silence, Predictor and Davitamon (the 2006 sponsor) are all owned by the same corporation and they are just simply migrating the team marketing efforts between their three product lines. 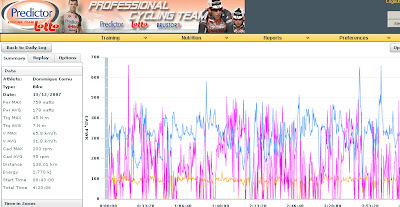 I'm excited to head to Spain and start working with new riders such as Yaroslav Popovych and continue supporting the riders who used TrainingPeaks on a daily basis in 2007. For those riders who have either retired or moved on to other teams, their data has migrated along with them and TrainingPeaks will continue to be their data management system if they choose to.